Posted on October 12, 2015, 8:00 am, by Ivan G. Shreve, Jr., under Anniversary, Radio crime, Radio mystery. My father, being considerably older, was also a disappointment as far as radio memories were concerned. He patiently explained to me that growing up, he didn’t have time for “all that foolishness.” (Don’t ever get him started on stories about his childhood—there’s a reason why they called that era The Great Depression.) Oddly enough, he did remember with fondness a radio detective that premiered on NBC Blue on this date in 1937: Mr. Keen, Tracer of Lost Persons. Mr. Keen, Tracer of Lost Persons originated in the daytime drama factory of Anne and Frank Hummert. The Hummerts’ soap opera empire was legendary; classic series from their stable include The Romance of Helen Trent, Ma Perkins, Backstage Wife, and Our Gal Sunday. Mr. Keen was not dissimilar to their daytime programs — in fact, it began on the Blue Network as a three-day-a-week quarter-hour (only it was broadcast at 7:15pm). For many years, the program’s announcer intoned that the show was based on “one of the most famous characters of American fiction”…and yet no one has been able to produce the “Mr. Keen” novel that purportedly provided the inspiration for the long-running show. OTR historian Jack French has opined that the origins of the “kindly old investigator” might be traced (see what I did there?) 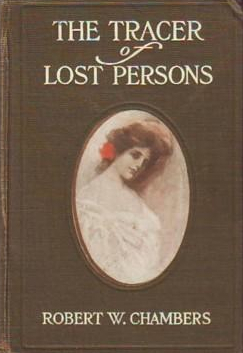 to a 1906 novel, The Tracer of Lost Persons, written by Robert W. Chambers. Setting the origins of its main character aside, Mr. Keen, Tracer of Lost Persons centered on an elderly investigator (think Barnaby Jones on radio) whose specialty was looking into the mysterious disappearances of people, as requested by their loved ones and/or family members. The serialized nature of the program in its early years gave the show more credibility than most (allowing the series to eschew the common “miracle-in-a-half-hour” trope). However, one mystery that was never addressed was why the show’s protagonist had no first name. (He must have been pretty busy.) The part of Mr. Keen was played, through most of its lengthy run, by Bennett Kilpack; Arthur Hughes and then Philip Clarke took over in Keen’s later years. Mr. Keen was assisted in his tracing endeavors by Irishman Mike Clancy (Jimmy Kelly), who supplied the necessary “muscle” for his soft-spoken boss…because let’s face it, Mike wasn’t the sharpest knife in the cutlery drawer. Mr. Keen demonstrated saint-like patience, explaining to Mike the situations in which the two men frequently found themselves…in almost the same manner that a tolerant parent would use to mentor a child. 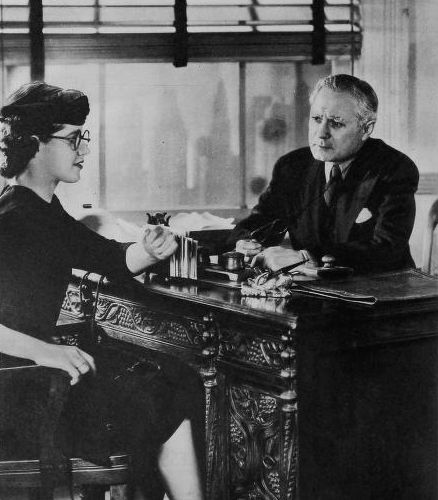 The only other regular character on Keen was Maisie Ellis (Florence Malone), who performed secretarial duties…and even she didn’t hold that job for too long, appearing only in the early years of the program. Because the Hummerts always kept an eye on what could be done to cut program costs (hey, with the number of shows they produced it only made sense), they generally relied on tried-and-true performers like Arline Blackburn, Mary Jane Higby, Vivian Smolen and Ned Wever (all of whom worked on their other shows). During its five years on NBC Blue, Mr. 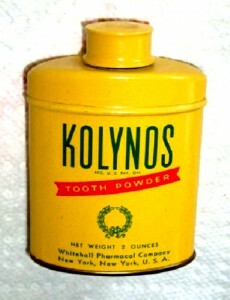 Keen, Tracer of Lost Persons was sponsored by Whitehall Pharmaceuticals. 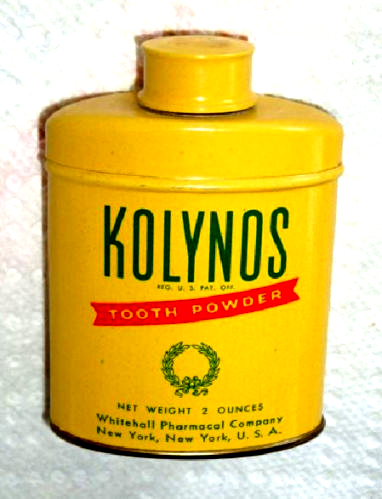 The primary commercials touted the benefits of Anacin and Kolynos toothpaste and tooth powder, but on occasion pitches for Aerowax, BiSoDol antacid, Heet liniment, and Hills cold tablets could be heard as well. Whitehall was, in fact, the show’s longest-running sponsor; when they stopped paying the bills in 1951 the likes of Chesterfield/L&M, RCA Victor, Procter & Gamble, and Dentyne started signing the paychecks. Mr. 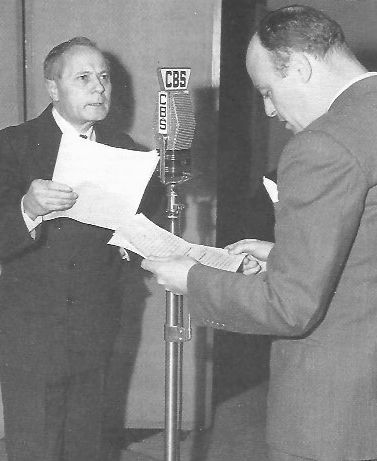 Keen moved to CBS in October of 1943 and continued its serialized format for another year before expanding to a half-hour (and shrinking to weekly status). With the adoption of the half-hour format, Mr. 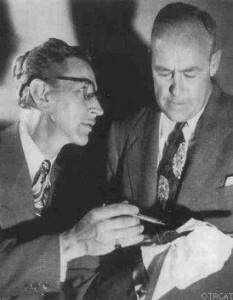 Keen began specializing in the solving of murders…even though the series kept its memorable theme song, “Someday I’ll Find You.” Once Keen and Clancy became indistinguishable from the other detective brethren and sistren on the air, listeners started to notice that the two men adopted a rather unorthodox approach to law enforcement. They rarely reported any of their conversations with witnesses and/or suspects to the police; they trampled crime scenes with little regard for search warrants—they even snatched up objects in evidence, contaminating them with their fingerprints. Keen was even able to arrest the guilty party at the end of each episode, despite having no authority to make such collars. “We usually work along with the police,” Keen would explain to those people asking too many questions…and while the cops always seemed in awe of the man (“The famous investigator?”) I’ll bet the district attorney was repeatedly tearing his hair out. Mr. 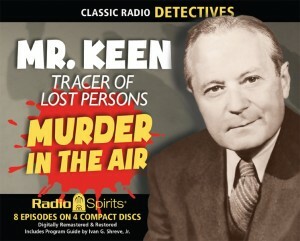 Keen, Tracer of Lost Persons was a hugely popular program during its almost twenty years on the air. It left CBS in 1951 and was welcomed as the prodigal son for a season on NBC before the show went back to its former CBS environs in 1952. It would stay at the “stars’ address” until September 26, 1955. By that time it had fully entered pop culture, and was even parodied in MAD magazine (“Kane Keen!”) and sent up by Bob Elliott and Ray Goulding as Mr. Trace, Keener Than Most Persons. (If I had a dime for every time someone referenced the Bob & Ray version when I mention Mr. Keen, I’d be a wealthy, wealthy man). Mr. 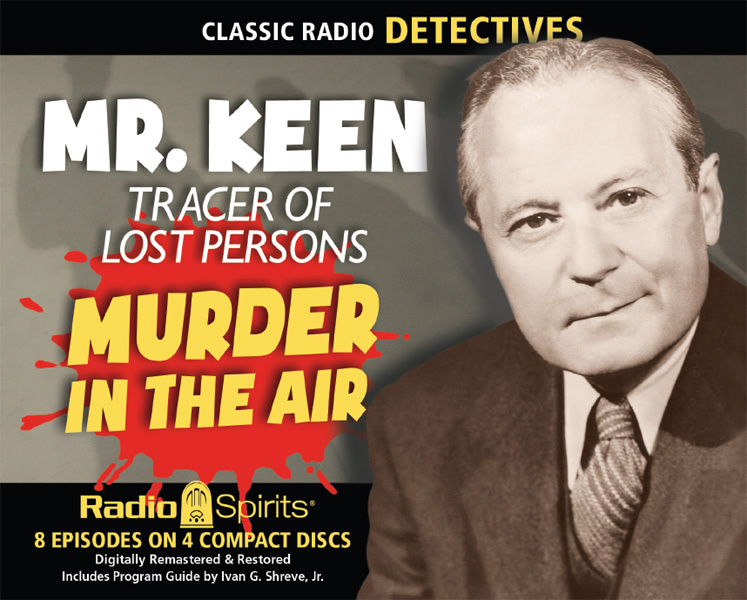 Keen, Tracer of Lost Persons is a huge fan favorite of old-time radio devotees today…though not in the manner you’d probably expect. It has an unintentional campy quality, no doubt due to its Hummert pedigree, owing to such lines of dialogue as, “Before I open this door, Mr. Keen, let me tell you something: no one in this house right now had anything to do with the murder of young Donald Travers, my sister’s husband.” It appeals to a generation brought up on deadpan dramatics like those featured on TV’s Batman, and as such Radio Spirits highly recommends its collection Murder in the Air to the novice Keen fan. (I wrote the liner notes!) When you’ve finished that, why not check out “the kindly old investigator” in a new adventure alongside fellow radio gumshoes like Pat Novak and Johnny Dollar in the C.J. Henderson-Joe Gentile novel Partners in Crime! « Happy Birthday, Elvia Allman!